1. 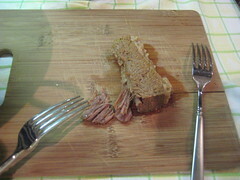 Shred the beef, using two forks. 2. 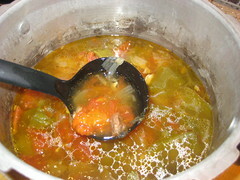 Heat the oil and add the onion, garlic and green pepper, until softened. 3. Add the meat and rest of the ingredients to the pot. 5. Stir occasionally, to avoid sticking. Serve over hot white rice. Makes 8 servings. 1. Melt the butter and add the onion rings. 2. Cook the onion in the butter until softened. 3. Mix the broth, water and worcestershire in a bowl and add to the onions. 4. Cover, and cook over low heat for 25 minutes. 5. 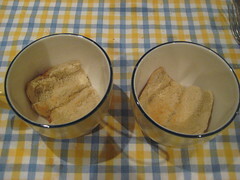 Place the toasted bread in bowls and top with the soup. 6. Add the grated cheese over the top. 7. Place the bowls in the oven, under the broiler, for a few minutes, until cheese is golden. Last Sunday, I took a trip to Publix with my family and my list. As I went back to my soups chapter, which I had deserted for a while, I found that the next recipe up was sopa de cebollas. 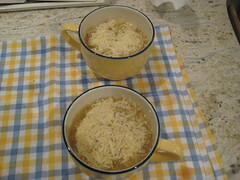 I love French Onion Soup so I was excited to make it at home. Because I needed consommé for the sopa de cebollas, I decided I wanted to make beef broth so I picked ropa vieja to make as well, where by in the process, you end up with both beef broth and meat for the ropa vieja. It didn’t occur to me until now that consommé may not actually be caldo de res. But, since Nitza doesn’t have a recipe for consommé in the book, I think my decision to go with caldo de res was just fine. Finally, I looked through the chapters and found one for Sandwiches y Bocaditos and thought – sandwiches? There’s a chapter on sandwiches? The first one was for Bocaditos de Bonito. I didn’t even know that bonito was a high grade tuna until a friend told me, so I decided to give it a try. Pastica de jamón is my all-time favorite Cuban sandwich spread. My father in law buys one from Sedano’s that is really amazing. When it’s my turn to pick up the kids, I have to avoid the fridge because that pastica screams loudly from inside. The recipe for Bocaditos de Bonito really calls for you to make the spread and put it on pan de molde (white bread) but I decided to just do the pastica version so I could try it out. 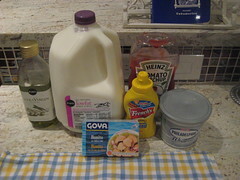 The ingredients were simple : 1 can bonito in oil, ½ cup ketchup, 2 teaspoons mustard, 2 Tablespoons milk, 1 teaspoon olive oil and 12 oz cream cheese (I went with the Whipped version, no reason). Basically, you take all those ingredients, except for the cream cheese, and you put them in the food processor until all ingredients are mixed well together. You take the mix from the food processor and you add it to another bowl where you have the cream cheese at room temp. Mix that in well and serve with Cuban crackers. My friends were commenting as I posted the process on Facebook on Sunday night and let’s just say they didn’t find the recipe or photos of the end result very appetizing. All I can tell you is that the pastica de jamón that calls for me at the suegros’ house ain’t got nothin’ on this pastica de bonito. Late Sunday night, I decided to prep ahead (see, I’m learning!) for Monday’s throwdown (with myself). I took the falda I would need and put it in the olla de presión to end up with both caldo de res (a.k.a. consommé in my book) and beef to shred for the ropa vieja. I made the beef broth by adding the usual 3 green peppers, 3 tomatoes, 3 cloves garlic, 1 onion, parsley and 1 Tablespoon of salt, along with 6 cups of water to the 2 pounds of falda (beef, maybe skirt steak? You ask for falda in Miami and the butcher knows what you need) and a soup bone I had frozen from a long, long time ago (last month when I started The Project). 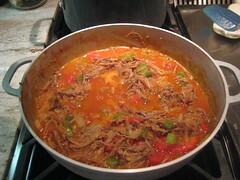 Once the chaca chaca started from the pressure cooker, it was time to lower the heat to medium for the next 30 minutes. That’s when I actually started to make the pastica de bonito, so I can tell you that it takes less than 30 minutes, from start to finish, on the pastica. Nice, right? Less than 30 minutes for pastica. Rachael Ray can feed an army of 300 in less than 30 minutes and esta que está aquí (this lady right here) can feed you pastica while you wait a few hours for your home cooked Cuban meal! When the 30 minutes were up, it was time to get busy on the meat. I had picked out the cooked meat with tongs and put it aside and strained the broth and put the caldo de res in mini containers for my sopa de cebollas. I had to get my camera. 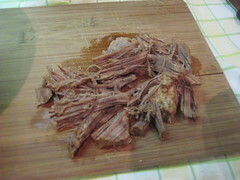 It was ropa vieja looking meat! Really, that easy? You see, ropa vieja is another one of those mystery foods to me. I’ve never watched anyone make it in front of me, it’s just something you had on your plate with rice. When I saw that my meat was looking like that ropa vieja that is one of the famous must-haves in Cuban food, I had to capture the moment. Once I had finished shredding the beef and singing some sort of "shredding the beef" song, I packed it up and put it aside to cool. Ready for the fridge for Monday night, along with the beef broth for the sopa de cebollas. Dinner on Monday was going to be a snap. Or, at least a few snaps. On Sunday, when I was planning my mega-weeknight meal (naïve), I had forgotten that I rarely ever leave work before 6:00 p.m. and that in order to make sopa de cebollas, ropa vieja and KILLER RICE (yeah! ), I was going to have to focus and leave on time. So, I did. At 6:00 p.m. I had forgotten to buy pan de molde! A quick search around the kitchen resulted in a quick fix – hot dog buns. Seriously! I opened them up, put them in the toaster and sliced them in half and had 2 servings, one for each of us. For the ropa vieja I should have chopped up the vegetables the night before, but will remember to do that the next time. I chopped 1 onion, 2 garlic cloves and 1 green pepper and put that sofrito mix in another deep pot with 1/3 cup olive oil. I took advantage and got the 2 garlic cloves I needed for Killer Rice (white rice) and put them into the olive oil to get the rice going as well in yet another pot. I actually had all four burners going for the first time in my life. When the sofrito was perfect smelling and steaming, I added the shredded beef I had prepped the night before. 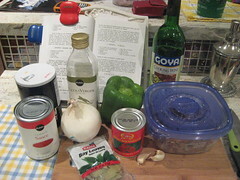 When you’ve got the sofrito and the meat all nice and cohabitated, you add a can of tomato sauce, 1 teaspoon of salt, 1 hoja de laurel (bay leaf), ½ cup vino seco and 1 can of pimientos morrones (pimentos) that you have taken out from their liquid and chopped up. That’s it, baby! Low heat for 15 to 20 minutes (or until you’ve got your act together, really) and you’re ready to rumble. We had sopa de cebollas for appetizer. I added some grated parmesan on the top that melted so nicely with the heat from the soup and we had ropa vieja con arroz blanco for our main dish. Dinner on Monday was amazing. My kids thought I was nuts with all the running around and all the pots and burners going at the same time. 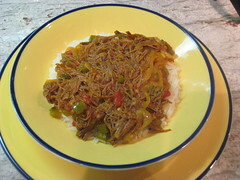 My daughter tried the ropa vieja and she liked it. She didn’t eat a whole plate of it, yet, but at least she liked it. That’s a big first for her. She helps with everything but doesn’t like much of anything. Ever since she turned four, she’s been extremely picky about her menu! 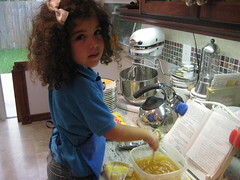 But, I keep her in the kitchen with me and I tell her she’s my taste tester. And, that if it weren’t for her taste testing my food, I wouldn’t know how to make it taste good. Somehow, that logic is working, and she’s loving The Project. Now, if I could only get her to try the pastica de bonito! 1. In a food processor, blend the bonito, ketchup, mustard, milk and oil. 2. 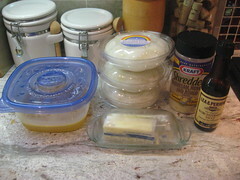 Beat the cream cheese until softened and add the blended ingredients from the food processor. 3. 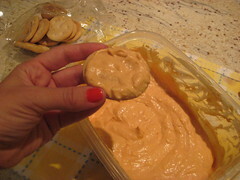 Mix well and spread over white bread to make tea sandwiches, or serve on top of cuban crackers. Earlier this week, I received a call from our food editor at The Miami Herald (ours because I work as the Marketing Director at the Miami Herald Media Company), to tell me that she had read my blog and wanted to feature it on the front of Tropical Life/Food this coming Thursday as a parallel to the movie release of Julie & Julia. So, after a few “my blog?”, “me?”, “are you sure?”, etc., I thought to myself – this is absolutely crazy, but how cool! This gives my crazy concept of wanting the Cuban cookery skills to continue to be passed down a chance to get out there. So, this morning, I began to prep for the recipes ahead – three to be exact! No need to go over the drill on this, everyone can sing with me at this point – onions, garlic, tomatoes, green peppers, salt and parsley. Add the chicken bones that were taken out of last Sunday’s roasted pre-cooked chicken and we’re olla de presión-ing. 20 minutes later – passed through the colander – we’ve got Caldo de Huesos de Pollo Asado. This is getting to be so simple it’s embarrassing. And, I can sing a little dance – I’m done with the caldos – ya! You know how everyone’s always got an opinion, right? Well, apparently, everyone has an opinion on sopa de plátano. This week, when people would inquire as to my next recipe and they’d find out it was sopa de plátano, they’d stare at me and ask me just how I was planning on making that. How? What do you mean how? The book says I need to get galleticas de plátano verde frito. Yes, and where will you get that? Since the recipe didn’t make any disclaimers about any extra steps around obtaining thesegalleticas (crackers), I thought I’d stroll into Publix to get my cracker meal or ground plantains or whatever and just mix it into some broth. She’s got to be kidding me – I have to make these crackers, oh wait!, she’s talking about mariquitas. She’s asking me to MAKE mariquitas? There are 4 million brands (more or less) of mariquitas here in Miami and I have to make them from scratch? After a few back and forths with my Facebook friends, I found the one person on my side. My friend’s mom, Mimi. Mimi makes mariquitas and her sopa de plátano rocks, I was told by her daughter. So, on my trip to Publix today, I called my friend to ask her to download Mimi’s tricks. “Pobrecita Christy”, said my friend. “Mimi says that you don’t have to do it this way but that if you want to, you should get a mandolin and it makes the slicing easier”. A mandolin? No. Not ever. No way. Not a chance. That thing is the tool of the devil. It almost sliced my thumb away during an attempt at apple and sage stuffing for Thanksgiving. Not gonna do it. Christy, el plátano es muy duro y se usa el guayo para cortar las rueditas finas. Mimi had said that the plantain is very tough and that without a mandolin, I was going to be upstream without a paddle. Fine. I’ll do it right. Then came the opinions – from everywhere – including my mom and mother in law and my friends’ moms – they thought I had totally lost my mind to want to peel the plantains, slice them and fry them, just to grind them up in a food processor in the end. After my husband and I sat down after about 2 hours of peeling, slicing and frying mariquitas, we thought it was good we did it this way. And that now that it was done, we could just do the powdered mariquitas they sell right under the whole mariquitas at Publix, specifically for preparing sopa de plátano. The photographer for the photo shoot showed up, my daughter helped me with the food processing and out came great ground mariquitas. I heated up the chicken stock I had just prepared in the morning, added ½ cup of the ground up mariquitas for every 1 cup of stock and stirred away. Tasted it, added lime juice from some limes and let it sit. My sopa de plátano was really good. I know we spent lots of time on it and I know there’s an easier way to do it. But, man, you could taste the difference between my soup and the one made with powdered stuff. This was the way people made sopa de plátano when getting a home cooked meal on their table was a priority. This is the way our grandmothers made it – before the powdered stuff. This is when there was time to do these things en familia (with the family). My project could be summed up right here. Why the heck do this project? And no, the answer is not because quiero pasar trabajo (I want to do things the hard way). It’s because it’s important to know the things that generations before us knew in order to pass them down to future generations. Cuban home cooking is one cornerstone of our culture. It sets Miami apart and gives us our own flavor. People look to Miami for it’s arroz con pollo, ropa vieja, vaca frita, frijoles negros y arroz blanco. Learning how to make these recipes is part of my Cuban heritage. Passing this on to my daughter and son is my goal with this project. Cooking this way won’t end here – ¡en mi casa, eso no pasará!